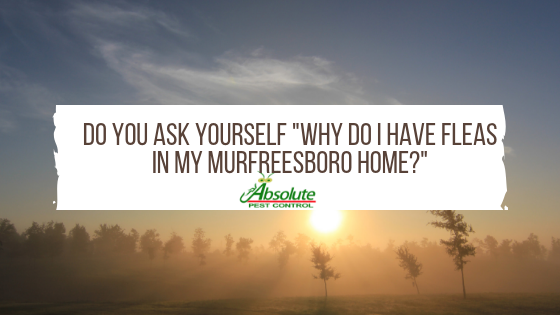 Why Do I Have Fleas In My Murfreesboro Home? Do you ask yourself “Why do I have fleas in my Murfreesboro home?” Sadly, fleas are a common problem for people. And, they are so irritating. They can be pesky and hard to treat. However, we can get rid of your flea problem inside and out. Fleas are tiny, wingless pests that feed on warm blooded mammals. There are 2500 different species of fleas! All of those parasitic fleas are feasting on humans, cats, dogs, etc. Adults eat 15 times their body weight in blood daily. Their jumping skills are amazing. They can jump 6 inches and hitch rides with passing animals or humans. Females lay 40-50 eggs per day. Your pets acquire fleas from kennels, groomers, other animals, other wildlife, in yards, or at the park. If you are asking “Do I Have Fleas?”, chances are you have fleas or some other pest. If it is a new residence, put on a pair of long white socks and visit each room. You can easily see fleas on the white socks. If your pets suddenly start itching nothing has changed, it’s probably fleas. Maintaining a regular pest control program will reduce the likelihood of your home getting fleas. Using a high quality flea collar or flea treatment on your pets is very good. Regular treatment of your yard also prevents fleas. Do not bring outdoor rugs or furnishings inside your home. Above all, Absolute Pest Control is dedicated to making your home or home away from home safe for you family. If you have a question about pests or any other pest problem, please call us at 615-220-1933 or click HERE to email us. We service most of Middle Tennessee including Smyrna, Murfreesboro, and LaVergne.